After grain-raising (two times) and completely sanding the soundbox and neck, it was time to start the finishing process. This time I decided to use a Preval spraygun to spray on the shellac sealer (Zinsser SealCoat, which is a 2-pound cut dewaxed shellac), because I didn't feel like pulling out the compressor and spraygun outfit yet for this tiny step. I sprayed a coat of the shellac and then filled the pores of the back, side, and neck with Target's HSF (High Solids Filler) 5100, which is a waterbase pore filler. (I still don't like using it as much as the oil-based paste filler, because it's more difficult to sand off; however, I do like it because you don't have to wait the four days I have to wait with the oil-based filler, before you can start the finishing process.) After the filler was dry, I sanded it and sprayed on two coats of the shellac, to have a good base for the Target USL waterbase finish I'll be using. 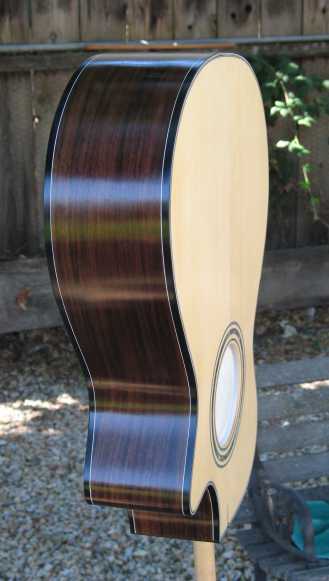 I hadn't used the Preval sprayers since I first began making guitars (this was over ten years ago); on my first few guitars, I either brushed on the nitro lacquer I was using then, or used the Preval sprayer. I had forgotten what it was like to use the Preval sprayer. 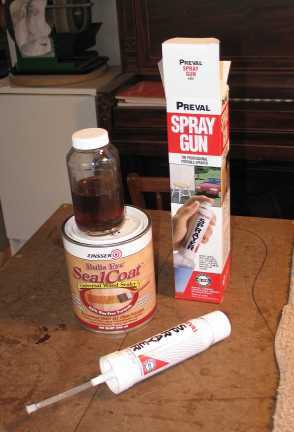 It worked extremely well for spraying on the shellac sealer coats. I highly recommend it for those little jobs you might have, if you don't have or don't want to pull out the compressor. I live in California, and it's been super-hot these last couple of weeks — in the 90's and 100's. Thus, I was a bit worried about how my finishing process would go, if the weather didn't break. Well, I lucked out — today the weather is at 75° (at the moment, around 11:00 a.m.), and the humidity is around 57%. Not ideal, but not bad, either. Supposedly the weather is to remain in this range for the rest of this coming week. Perfect for me, as these are the days I will be doing my spraying!!! 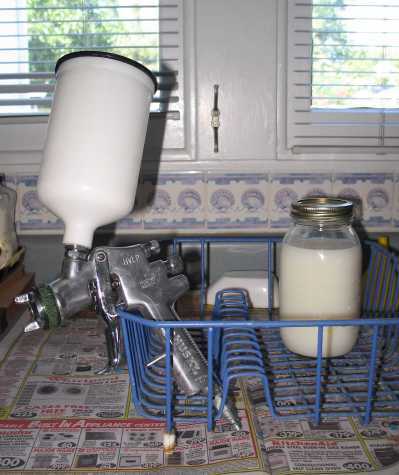 Here is the Husky (Campbell-Hausfeld) HVLP spraygun I got at Home Depot a couple of years ago, with the Target Coatings' USL waterbase lacquer. Here is my spraying station — my backyard under the shade of my fig tree! 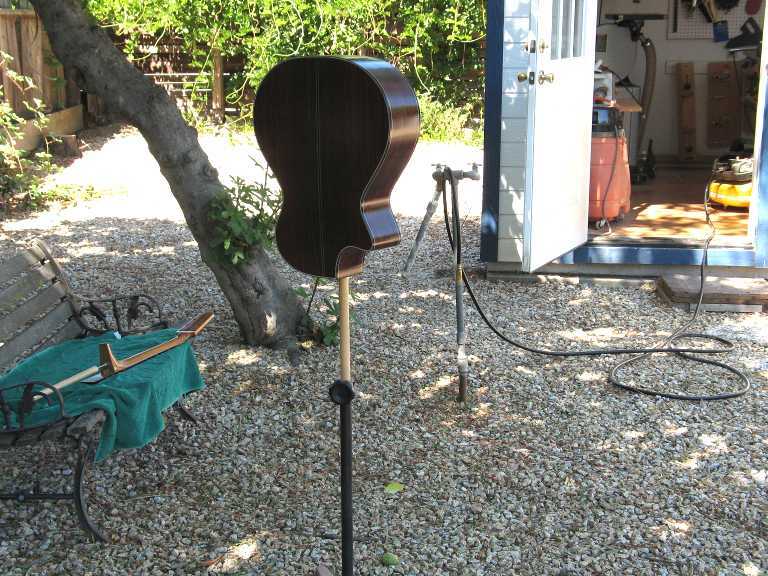 I have my little pancake compressor sitting in my little shed, and my guitar body clamped into my roller stand base. What you see here is the box after I have sprayed the very first coat. I don't actually spray it when it's on the stand; I hold it by the handle, so that I can be spraying with the surface pretty much horizontal, to prevent any possible runs, should I spray a bit too heavily. I sprayed it on light and even, to avoid the runs I tended to get because I used to spray it on too heavily. Lots of light coats will work out better than having to deal later with runs or sags in the finish! I will wait at least an hour between coats before I spray another. I had a successful spraying day today; it was the first time ever I didn't get ANY sags or runs!!! Either I'm getting better at setting the spray gun properly, or I'm getting better at my spraying technique, or it was just plain luck. I think a big part of it, however, was that I was much more conscious this time of spraying lighter, drier coats — in the past, I had thought that you needed to lay on a wet coat, as you do with lacquer. The USL levels out very nicely when you lay it on more thinly, actually. Sprayed 4 coats of USL, 1 hour apart. Level-sanded with 320 & 400 grit gold paper, wiped with denatured alcohol, sprayed 3 coats of USL. Level-sanded, wiped with denatured alcohol, sprayed 4 coats USL. Level-sanded, wiped with denatured alcohol, sprayed 2 final coats USL. 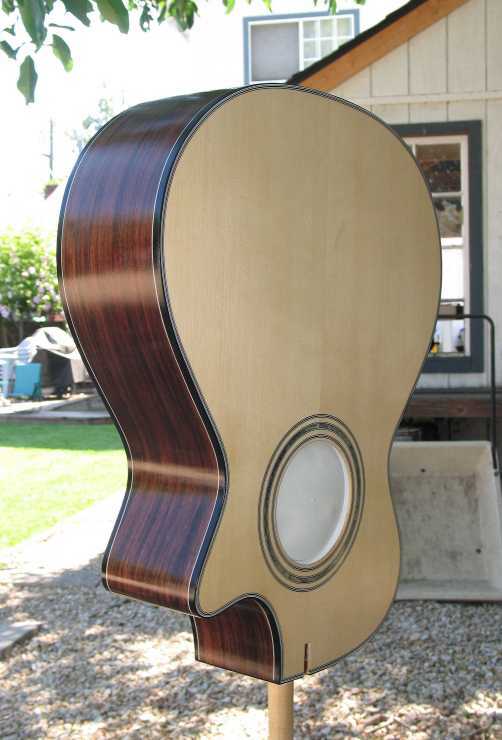 Now is the most difficult part of guitarmaking for me . . . . . . WAITING for the finish to cure ! ! ! At any rate, you will not see any more updates on this project until after August 14th, so, until then, have a good end-of-summer!!!!! OKAY — IT'S FINISHED!!! Wanna see it?? ?